My husband’s job requires us to move around a lot, which means I am constantly looking to make our new house a home. Not always easy, but I have found comfort and storage are two things that help make us feel in harmony with our place. One piece of furniture that always brings comfort and storage is a sofa table. It is perfect in allowing us to beautifully store some of our favorite pieces or a place to put our glass of wine while we curl up on the couch, yes, please! 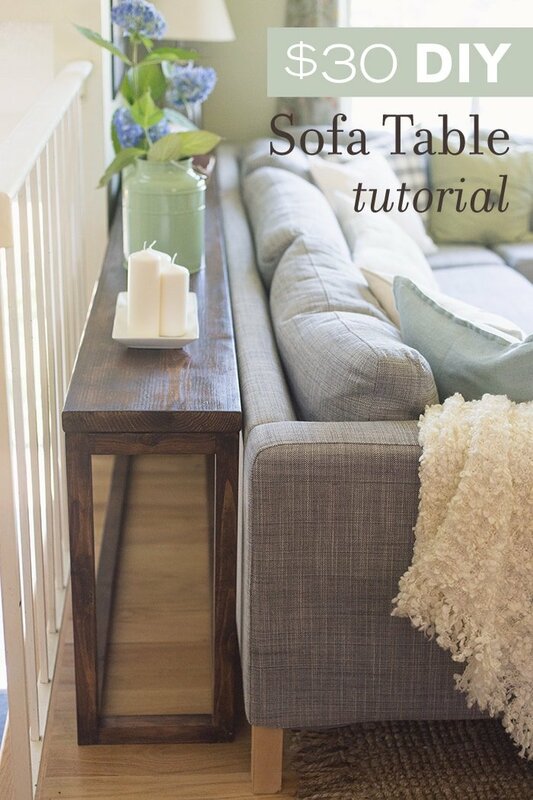 Continue reading to find some of my favorite DIY sofa tables. Starting with your basic rustic, sofa table from Worthington Court. I really like this tutorial because it shows how to build a table AND how to decorate it. Perfect! This sofa table from JennaSue Design does not overdo it with the rustic appeal, but still embraces that beautiful wood color we all love to incorporate into our homes! If you are looking for a sofa table that is easy on the wallet, this one on Always Never Done is perfect. Especially for small apartments or simple projects! All around easy to do. 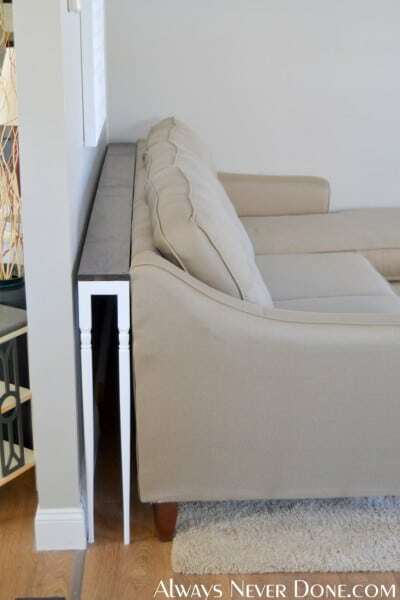 Most sofa tables are made to be hidden between the couch and the wall. This Black + Decker idea still embraces what we love about sofa tables, except with additional shelving to make that space super pretty. Some use their sofa tables for decoration, others use it for convenience. Up the convenience of this sofa table via Homedit with a built-in outlet. Hello, phone charger! The instructions for this DIY via the Home I Have Made are so clear, it emphasizes how quick you can put this together, 10 minutes! Super quick and fairly cheap! If you have a window or a pretty painting behind your couch, most of the DIY’s we’ve shown you may not be plausible, so go for this side table from Heather’s Handmade Life instead! If you are looking to embrace the open sofa table and you want the piece to have a bit of character, this piece from Her Toolbelt is for you. 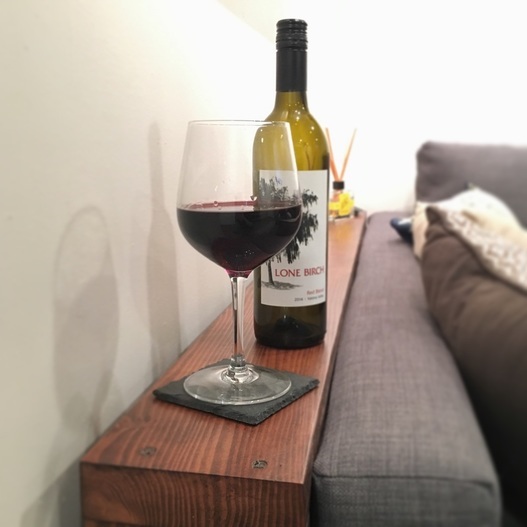 This DIY project from Effie Row takes the armrest of your couch, extends it just a bit, so you have the perfect amount of space for a glass of wine. What more do you need? Concrete is on the rise in popularity, so it is only appropriate that we incorporate a concrete sofa table. Not super simple, but this DIY from Garden Hill Country is certainly not difficult. 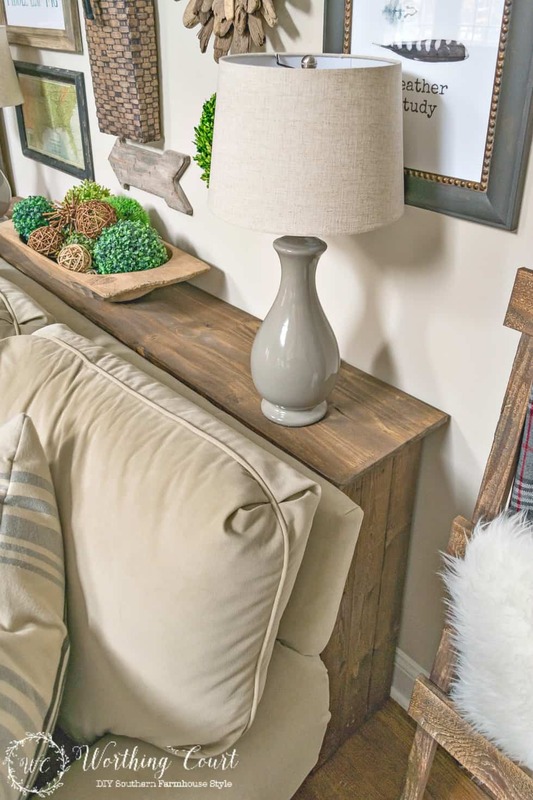 There are tons of ways to go rustic; this DIY from Remodelaholic is an alternative version of the classic rustic sofa table look. 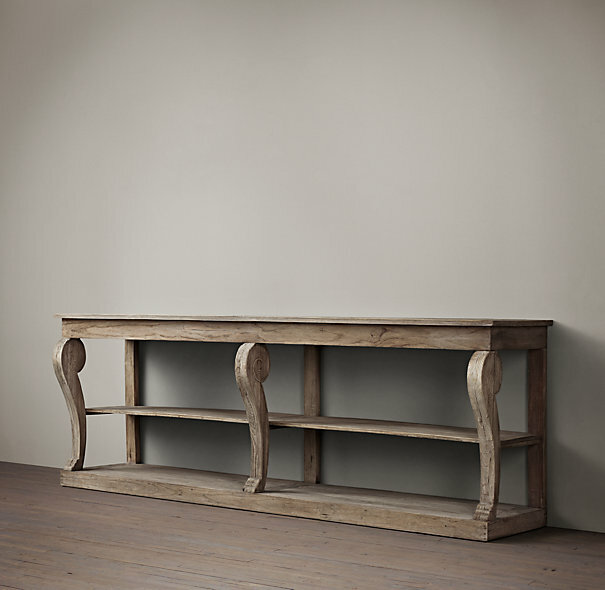 This French country chic sofa table from Picklee is pretty and delicate while being a bit rustic at the same time. It can be fairly simple and cheap to put together using beautiful reclaimed pieces. 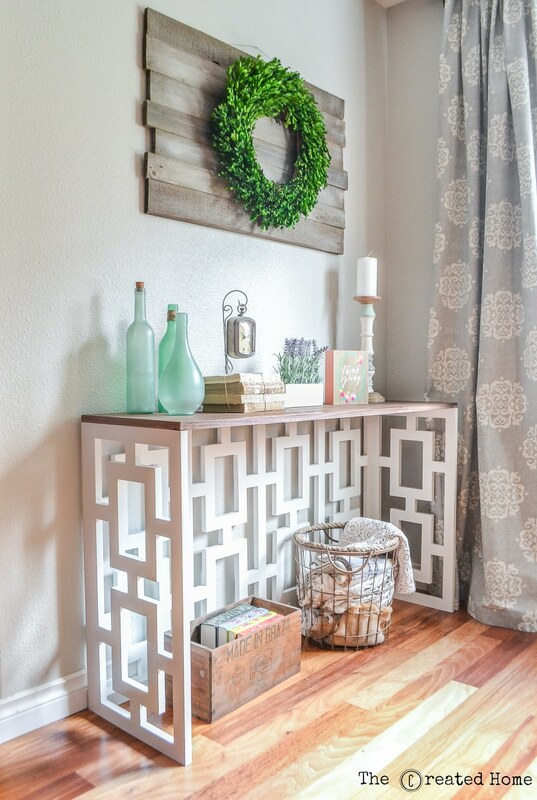 Using reclaimed wood like in this DIY from A Diamond in the Stuff is a beautiful thing. You are recycling and this wood is often so beautiful with its history and characteristic glow. Too many sofa tables look the same, so this one from Hative is a rebellion on some of the more standard styles. It has plenty of character and depth, but easy to follow directions. I love this sofa table from Rogue Engineer because of how simple it is and how little you need to dress it up. It is easy to put together and the design does all the talking. One shall have this canister to clean around the sofa and living room. For the home that prefers a modern and updated look, there is this modern sofa table from Superette. Simplistic at its finest. A lot of rustic sofa tables focus on a reclaimed wood look, which is beautiful, but for another option check out this modern rustic look at Remodelaholic. It has beautiful clean wood in 2 colors to add some depth. 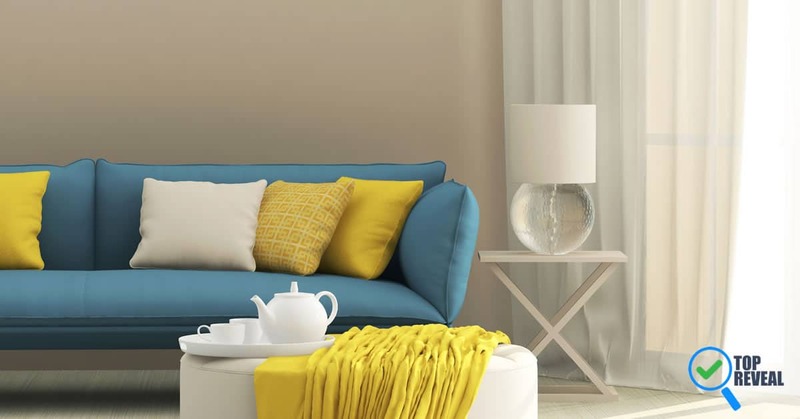 Sofa tables can be more than decoration and convenience, as seen here by Remove and Replace. They can be the perfect spot to store movies, fluffy blankets, or just some simple flowers. If you are no newbie to DIY projects, test your skills with this sofa table from Tommy and Ellie. Multiple parts, beautiful coloring, and big reward. It would look perfect with a nice cooling-fan around too. 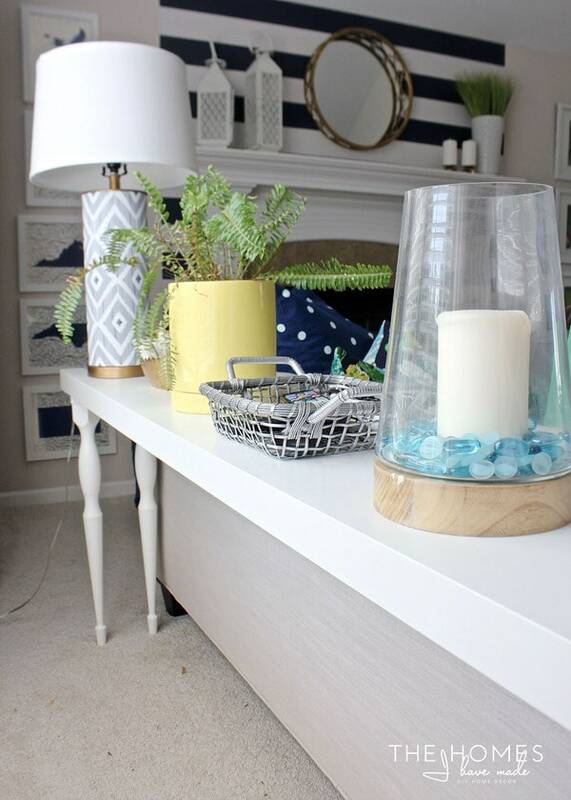 I love this sofa table because the blogger took an ordinary piece of furniture and updated it. It has been saved and logged not necessarily for the design, but the incredible creativity we can all learn from this blogger. One can steam mop the floor with this steaming gadget. A sofa designed perfectly for that bachelorette pad or flirty room. 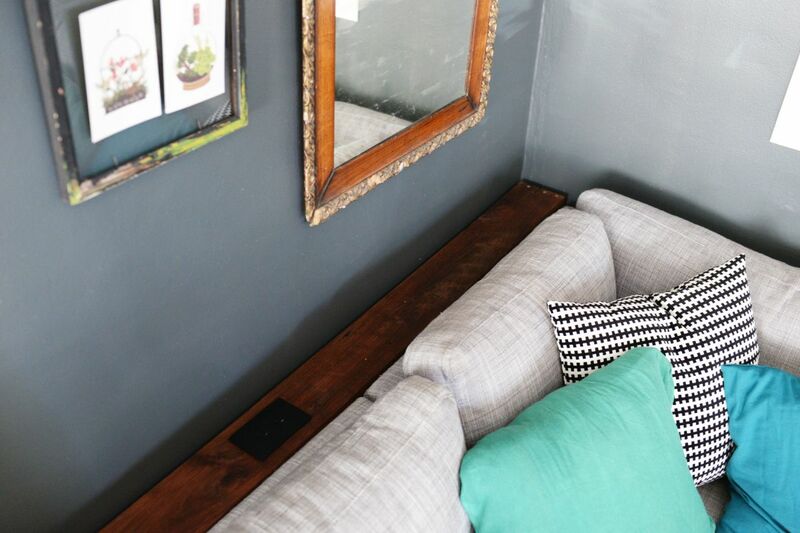 It may look overwhelming, but trust me, this DIY via Jen Woodhouse is completely doable. A sofa table that is completely simplistic, this design on Saffron Avenue allows you to let the decorations do the talking, or keep it clean and neat. Just like your space. 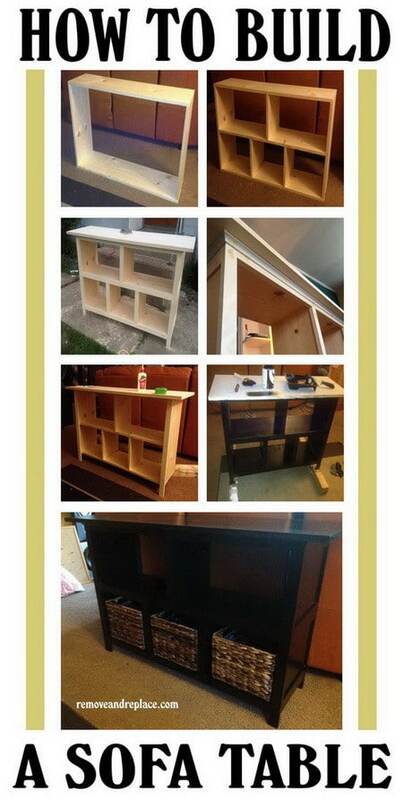 A sofa table with shelves so beautiful, this project is so pretty you won’t want to put anything on them. You can sanitize your sofa with this appliance. 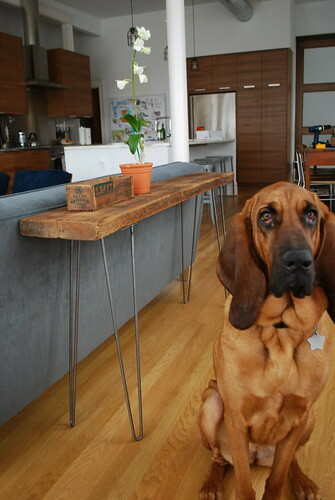 We have seen the cheapest and the quickest DIY sofa tables, but this reclaimed wood table claims to be the easiest. I think it may be because the directions make it SO easy to follow. Either way, this one is perfect for newbies, advanced DIY’ers with only a few minutes to spare, and everyone in-between. Did you enjoy the article? Beautiful storage and comfort are a few things that make a great house a great home. Which is why sofa tables get so much fantastic utility! Let me know what you think in the comments below and share this with a friend who could use some sofa table inspiration.